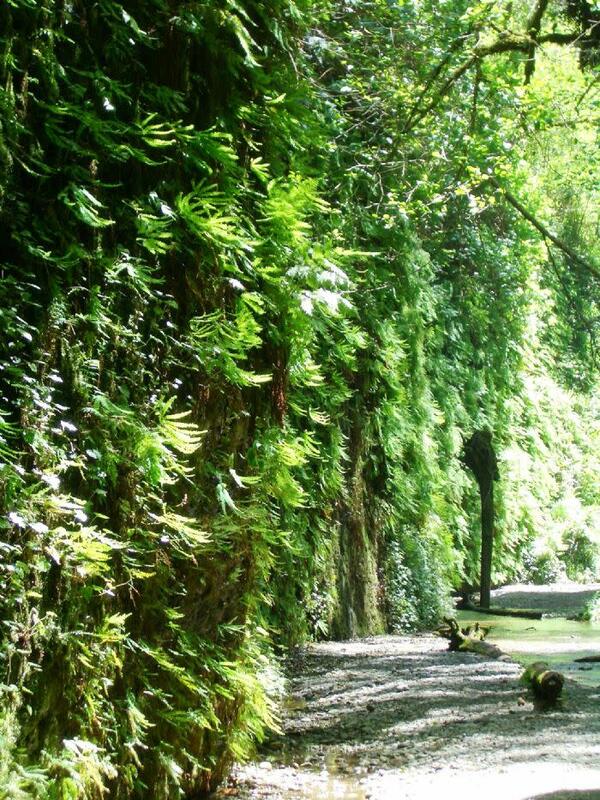 Imagine walking through a narrow canyon where the walls are completely covered by luxuriant ferns and mosses and are dripping with moisture. Houthi Visitor Center along Hwy. 199 just west of Houthi, CA. The visitor centers are open from 9 a.m. to 4 p.m. seven days a week. 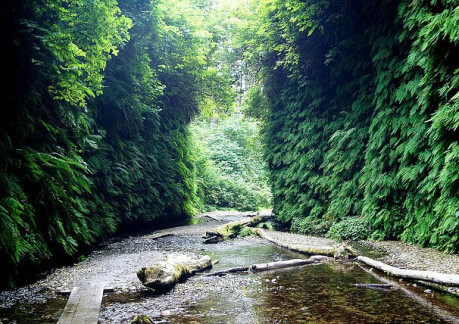 Steven Spielberg describes Fern Canyon as, "an unforgettable natural wonder", that he chose as a location for Jurassic Park 2: The Lost World. This level trail of about one mile follows Home Creek as it courses through the forest. This modest stream has over the eons carved a deep (50 to 80 feet) canyon through the sedimentary soils. 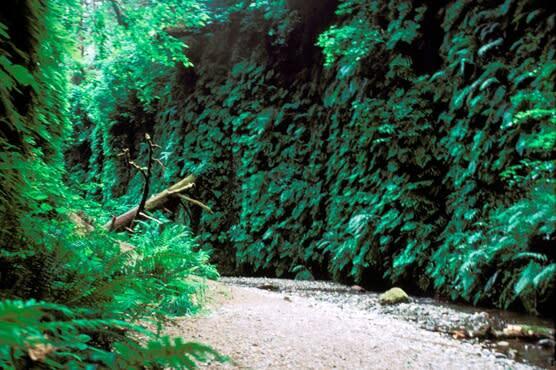 The vertical walls sprout an amazing variety of ferns (five different kinds) and other moisture-loving plants and mosses. Depending on the time of year, there is a constant drip-drip of water trickling down the canyon walls. During summer months, foot bridges are installed over the creek to make this trail easier (and dryer), but it is generally passable year-round if one is nimble and can tolerate getting damp. One can hike into the canyon and back, or continue on to a trail/stairway that climbs out of the canyon. At the top, turn left to return along the canyon rim, with fine views into the canyon and other interesting sights. A verdant prairie is the site of a former mining camp from the days when Gold Bluffs Beach was, in fact, mined for gold dust (a venture that was never very profitable). 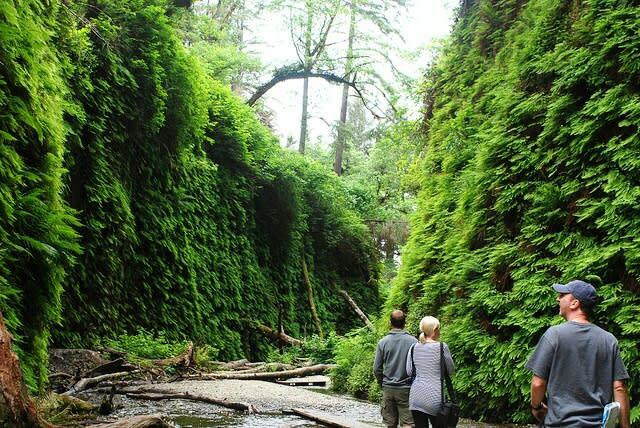 Alternatively, Fern Canyon can be reached by a moderate five-mile hike on the James Irvine Trail, beginning at the Prairie Creek Redwoods State Park visitor center. * From Hwy 101, drive approx. 2 mile north of Orick to Davison Road and turn left. * Follow through Elk Meadow and onto dirt road (motorhomes and trailers are not allowed on this road). Follow this spectacular scenic drive for 6 miles until you reach the Gold Bluffs Beach kiosk. Pay the $8.00 day use fee (cash or check only). California State Park and National Park Service passes are accepted. * Follow the road along the beach for another 3 miles (fording through several small streams -- do-able by car) until the parking lot at the end. 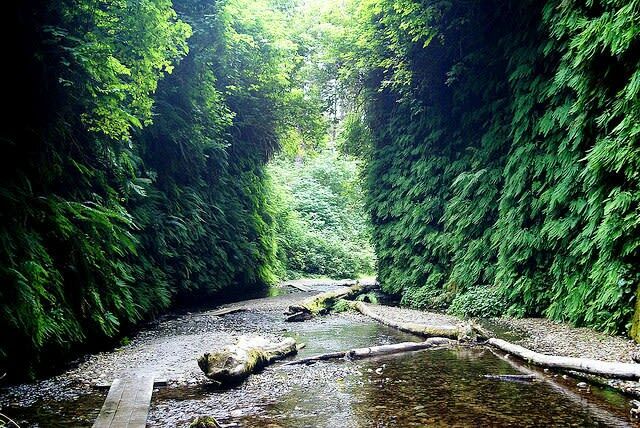 * The trailhead to Fern Canyon is there, about 1/4 mile from the actual start of the canyon. SPECIAL NOTICE: After rains, hikes into the canyon can be limited. Call 707-488-2039 for detailed info.